This Victorian mill area of Burnley has captured the imagination of many people over a wide area and rightly so, for it has re-kindled what was a flagging interest in Burnley’s once prosperous textile industry: In 1911 Burnley was the cotton capital of the world with over 99,000 looms and 90% of the population were at one time employed in the weaving trade. Old and decaying mill premises and the long stretch of the Leeds and Liverpool Canal, which at one time served the industry so well, have achieved a romantic image, which is totally unfounded, for many of its dwellings by the canal were pitifully small, damp, unhygienic, over – crowded and only basically furnished. This no doubt explained the large numbers of men, who could be found drunk and disorderly and aimlessly hanging around street comers. 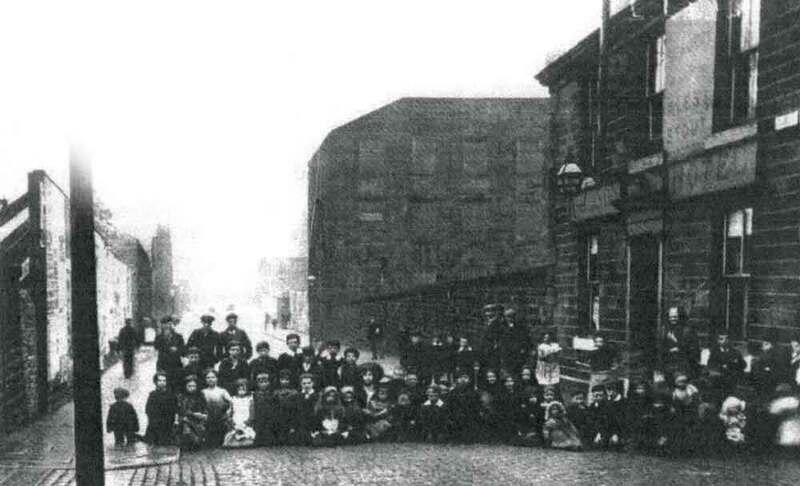 In 1889 there were 309 pubs, taverns and beer houses in the town with a hostelry of some kind on virtually every street comer and Burnley was described in the 1880s as the most drunken town in England. 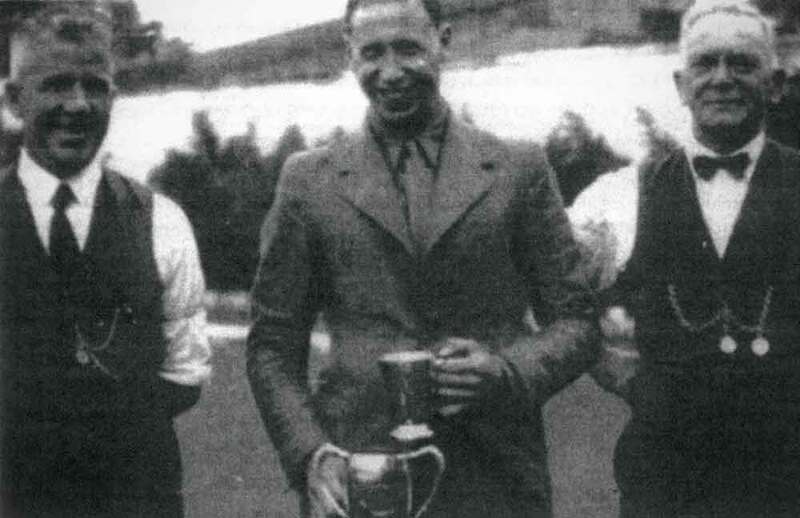 George Formby at the Bowling Green Hotel, Burney in 1933, Arthur Hind Chapples is picured on the left. When John Wesley attempted to preach for the second time in the town centre from a mounting block outside the Thorn Hotel in 1786, he had to run for his life, hiding in a privy in Wapping, when a drunken mob attacked him. In my early years our family lived in two parts of the so-called Weavers’ Triangle, a term that was first coined in the 1970s by the then editor of the Burnley Express, Richard Catlow. For two years my father Arthur was landlord of the Nel son Hotel on Trafalgar Street, now the Ministry of Ale, and later we spent three years at 43. Hammerton Street, now Brunlea Travel, which was Burnley’s first Co-op in the mid 1840s. My parents ran a mixed business there, selling groceries, pasties called colloquially torpedoes, sweets, bread, cof fee, tea, milk and beer. My mother used to send any unsold milk to the poor chil dren of St James’ Junior School and claimed that she was the first person in the country to introduce free school milk. The area beyond the Nelson Hotel remains unchanged with a series of mill buildings, but in those days there was also a clogger, a confectioner’s and a plumber leading to Holy Trinity Boys’ School, usually known as Sandygate School, where the head was the much-respected Mr Henir. Leading to Cow Lane was Vulcan Street, where in one of the four cottages, a Mr Dunleavy had a sweet shop, which also sold bread. The old man had lost an eye, whilst chopping wood and I am sure, having seen the appalling state of his premises, modern hygiene regulations would have refused him a licence to trade today. Despite the abject poverty and appalling living conditions suf fered by the vast majority of people in the Weavers’ Triangle, the area was always buzzing with life and most people remained remarkably cheerful and were always in and out of each other’s homes, seldom knocking. There would be fights, but whenever there was a crisis, be it a death or illness, the community would all pull to gether. My father had been asked to turn professional after scoring the winning goal in the 1931 Keighley Cup Final and that is when he met Burnley’s legendary captain Tommy Boyle, who was sitting in the kitchen of his pub. Fortunately he was sober on that occasion, for Tommy, a monosyllabic Barnsley man with little conversation, had such a bad reputation that the police were normally called, as soon as he walked on to licensed premises. By the 1930s he had fallen on hard times. He briefly ran the Pedestrian Inn at 30 Parker Lane in 1923, where the central library now stands. He then moved to Blackpool, where, when inebriated, he assaulted a tram conductor and was fined, then his wife left him. He got into serious, financial difficulties and had a nervous breakdown. He died in 1940 in Whittingham Mental Hospital aged 51. The Rev David Wiseman, who has written several books about the Clarets believes Bombardier Boyle, who was badly injured during WW I, may well have suffered brain damage through so often powerfully heading the heavy leather ball used in those days. “I am Lord of Burnley.” This is how Bob Lord described himself when he met Prince Philip in the royal box at the 1962 Cup Final. Cantankerous, brusque and blunt were just three of the adjectives used by local and national journalists about the forthright chairman of Burnley Football Club and any derogatory remarks made by the likes of Don Smith of the Burnley Express or Noel Wild of the Nelson Leader led to their being banned from the press box at Turf Moor. Consequently my father was asked to act as a temporary sports reporter in their stead. Robert William Lord, like Stanley Matthews, was the son of a barber. His father Fred’s shop was at 133 Parliament Street in Burnley, which is now a newsagent’s shop. Bob, who was born in 1908, was originally a butcher’s boy, and began hawking meat around the town with a horse and cart. He made £130 profit in his first year and by the age of 19 he had saved up the £50 he needed to buy a chopping block, knives and refrigerator (only the third in the town) and set up in the basement of his father’s shop. As an apprentice he earned 30 shillings a week and when his boss refused to give him a rise, Bob bought him out for £300 and opened his first shop. His business grew until eventually he had 14 butcher’s shops and a wholesale meat business at Lowerhouse and he began supplying meat to many schools and prisons. Bob’s enthusiasm for football began as a six-year-old, when he saw Burnley captain Tommy Boyle on the Town Hall balcony holding the English Cup in 1914. He returned empty bottles to public houses and did odd jobs for his brother in order to buy his half a guinea season ticket. 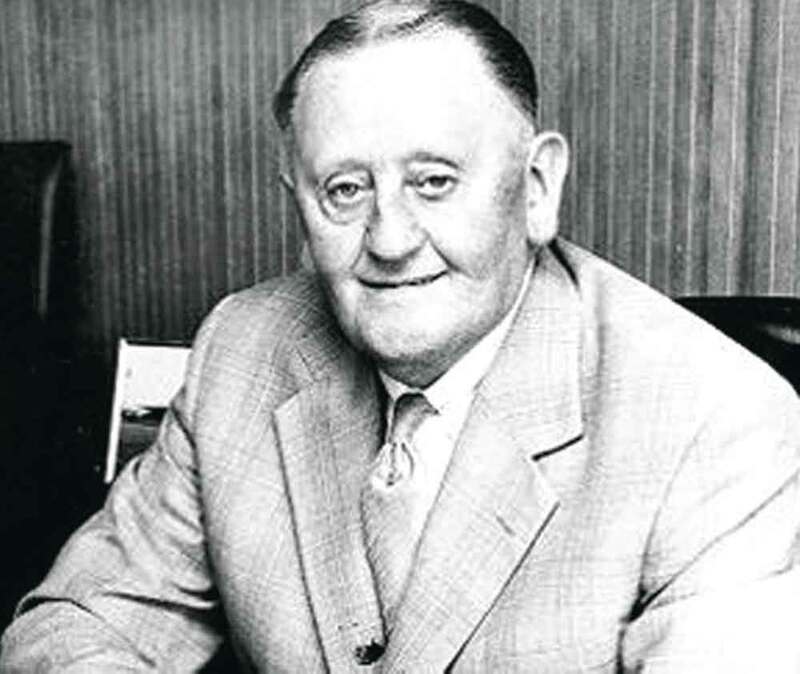 He bought his first three shares in Burnley Football Club in May 1950 and by 1981 he had 2,800. The team was built around Jimmy Adamson and Jimmy Mcllroy and instead of buying players in for exorbitant fees, like the big city clubs did, Burnley’s was created by good scouts scouring particularly the North-East of Eng land in search of talented teenagers. It was said that if you waited at any colliery gates in the North East for the cage to come up, eight out of the ten miners would be gifted footballers. In the 1950s when there was still meat rationing, Bob ensured that every member of his squad was given plenty of fillet steak and a plump turkey for Christmas! George Formby played Burnley on many occasions, orig inally as George Hoy. On October 25th 1933, 29-year-old George, accompa nied by his glamorous, but domineering wife Beryl, re turned to Burnley to play the Palace Theatre, where he was topping the bill. They had met when she was a professional clog dancer from Accrington in a duo called “The Two Violets.” George and Beryl stayed overnight at the Bowling Green Hotel, now a children’s home, which is on Clifton Street near the Barracks railway station. At that time the pub was run by my grandfather, Arthur Hind Chapples. While George was there, a charity bowling tournament was taking place, so Arthur asked George if he would be kind enough to present the trophies. Here we see him on the bowling green with Arthur to his right. Over tea my father, then 19 years old, was invited to meet their famous guest, whom he found to be an unsophisticated Lancastrian with a ready smile but little conversation. His wife, who was also his manager, was a smart and at tractive young woman, who was very personable and chatty. She was famous for doling out pocket money of £1 a week to her comic husband, who was earning thousands through his records, plays, shows, pantomimes and film appearances. She was ruthless in business and ruled George with an iron fist, but it is doubtful he would ever have achieved the success he did without her drive, ambition and business acumen.